THE SUPER-FAST WAY TO ATTRACT BUTTERFLIES AND BIRDS! There's something wonderful about having butterflies and birds around, especially when it involves colorful flowers in your back yard or just about any patch of ground you desire! Enjoying the splendor and the beauty of these fascinating creatures may be much easier than you would have ever imagined. 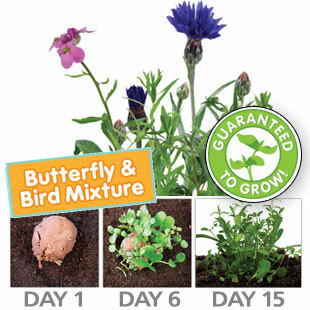 Now you can attract butterflies and birds fast and easy with the Butterfly & Bird Garden Kit! This kit contains 6 seed bombs with a great variation of beautiful flowers, including Calendula, Forget-Me-Not, Larkspur, Rose Mallow, Bachelor Button, Alyssum, and more. Plus each seed ball covers about one square foot of these colorful flowers. Throw, place or plant your seed balls anywhere you want to enjoy colorful and beautiful flowers that attract birds and butterflies. Best of all, you are providing much needed habitat for these wildlife resources and your reward is to enjoy the all the colors and sounds they provide. Guaranteed to sprout, just water and watch them grow! It's fast and easy, and best of all they are proudly made in the United States. These "Throw and Grow" Flowers are the perfect way to spruce up almost any patch of ground. Attract Butterflies and Birds anywhere! This exciting kit "Butterfly & Bird Mixture Seed Bombs" is listed as top 100 Best Children's Products 2012 Award from Dr. Toy's. You don't have to be a child though to enjoy the beauty of butterflies and birds around your home and in your yard! The secret is in the specially developed Seed Balls: The seeds are protected from animals, insects and over-watering. Guaranteed to sprout, you can throw them, toss them, crush them, or leave them. Then water and watch them grow! Proudly made in the United States with top quality ingredients. Grows (bloomed) in about 6 weeks! Each ball covers about one square foot of earth in plants. Each Seed Ball is approx. 1" in diameter. Water on top, or wait for rain. Seed Balls will germinate in 3 to 5 days and flower in about 6 weeks. You can plant these to make a border, garden, or accent pot. Allow one square foot per seed bomb. Throw them outside just before a storm! Throw them where they will get 4 to 6 hours of direct sunlight or bright light a day.